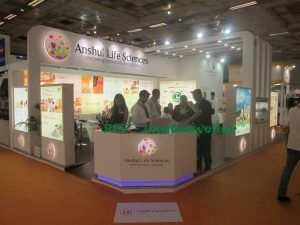 New Delhi, 22nd August, 2016: UBM India, India’s leading exhibition organizer, launched the 11th edition of Food ingredients India & Health ingredients (Fi India & Hi), the most comprehensive B2B show in the Indian Sub-Continent for food and health ingredients, processing and packaing industry today. After successfully catering to Western India since 2006, the 2016 edition of Fi India is being held in New Delhi at Pragati Maidan. The three day trade expo (22nd -24th August) was inaugurated by key dignitaries Shri. Sagar Kurade, President, All India Food Processers Association ( AIFPA ); Dr. R. B Smarta, Hon. Secretary – HADSA & MD, Interlink Marketing Consultancy; Mr. John van der Valk, Managing Director, UBM EMEA; Mr. Michael Duck, Executive Vice President, UBM Asia and Mr. Yogesh Mudras, Managing Director, UBM India, amidst an august industry gathering. 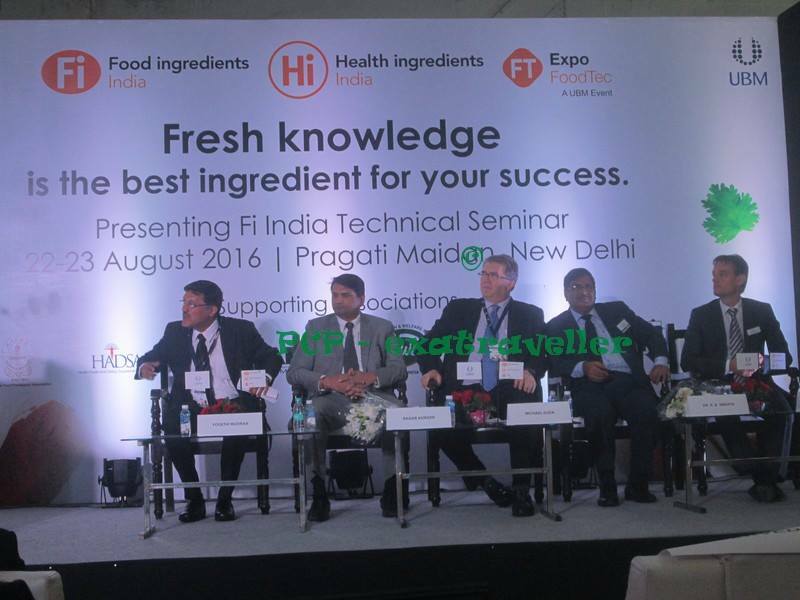 The expo will now be annually rotating between India’s two unique promising food hubs i.e Mumbai and New Delhi. 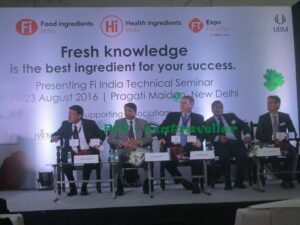 The 2016 edition of Fi India & Hi in New Delhi offers opportunities for industry players to take advantage of the growing food manufacturing hub in Northern India. In addition to the power-packed seminars, the expo also features an Expo Foodtec Pavilion dedicated to Food Technology – Processing and Packaging companies, a China Pavilion by CCCHMPIE and an AIFA Pavilion featuring food processing companies. For the third year, Fi India & Hi is hosting a two-day Free Bakery Workshop ‘All about Doughnuts’ in association with Assocom Institute of Bakery Technology & Management (AIBTM), a comprehensive teaching, training and research centre specifically for baking technology and allied disciplines. The workshop includes both seminars and “ions that include topics such as Food Safety, Food Sanitation & Quality control, Importance of Decoration, Handling of Doughnuts and Packaging and demonstration on snacking doughnuts. A Bakery Championship will be conducted on the third day to encourage and felicitate expertise among bakers through live competitions. The expo also features an Innovative product showcase that highlights the exhibitors leading the way in innovation in the industry and an Innovative Ingredients Championship. As a pre-cursor to the expo, UBM India and Fi India inaugurated the first ever Fi Pre-Connect Congress, a platform that discussed and ideated the scope of Indian food manufacturing industries, challenges faced in safety and regulatory aspects, cutting edge insights on new technologies, innovative business-marketing strategies and other trending topics. The Fi Pre-Connect Congress gathered industry experts under one roof to pool in thoughts and find solutions to Indian food-beverage sector’s most pressing issues in a closed-door, organized and knowledge driven format. The closed door discussions included best practice strategies to be implemented in the quality, safety, regulatory, supply chain, operations and retail aspects of the food-beverage and ingredients segment. UBM India is India’s leading exhibition organizer that provides the industry with platforms that bring together buyers and sellers from around the world, through a portfolio of exhibitions, content led conference and seminars. For further details, please visit ubmindia.in.